If you were running a women’s golf tournament anywhere in Australia and I asked you who you would want in the field you’d probably say the same trio. 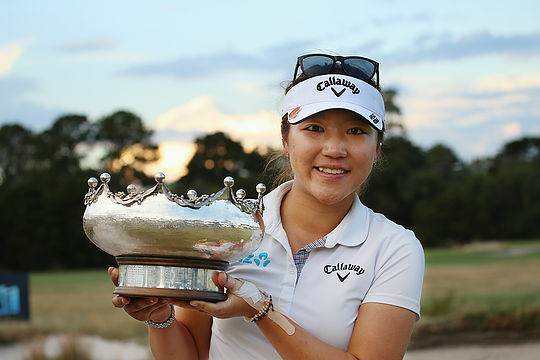 World No.1 Lydia Ko would probably be at the top of the hit-list but Aussie icon Karrie Webb and our latest young Aussie sensation Minjee Lee would not be far behind. And the good news is all three will be heading for The Grange in Adelaide in February for the ISPS Handa Women’s Australian Open championship. Ko, who is being treated like a Tour veteran at the age of just 18 is defending champion in the event after the New Zealander became its youngest ever winner with her victory at Royal Melbourne earlier this year. Yet she will definitely not get things her own way with the two Aussie stars ready to defend their Aussie territory. In fact Webb has already won this event five times and Lee is a certain future winner of this prestige title. “The ISPS Handa Women’s Australian Open really helped to jump-start a great year for me in 2015 and I am thrilled to be returning as the defending champion,” Ko said. Likewise the ageless Webb wants a good start to her year as she begins her preparation for the ultimate goal of selection in the Australian team for the Olympic Games later in 2016. “The Patricia Bridges Bowl [Australian Open trophy] has always been special to me – it’s a great trophy with some great names on it,” Webb said. The 2016 ISPS Handa Women’s Australian Open will be held from February 18-21 on The Grange Golf Club’s West Course. Jointly sanctioned by the LPGA Tour and the Ladies European Tour, the event is expected to boast a $1.8m purse, making it the richest event in Australian golf this summer.